I teach to the California Content Standards for History-Social Science. In all of the schools where I have worked, I have primarily developed my own curriculum, drawing on resources from Scott Foresman History-Social Science. ​2.2 Students demonstrate map skills by describing the absolute and relative loca­tions of people, places, and environments. Label from memory a simple map of the North American continent, including the countries, oceans, Great Lakes, major rivers, and mountain ranges. 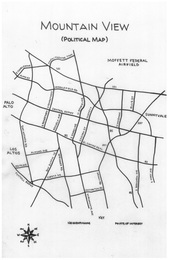 Identify the essen­tial map elements: title, legend, directional indicator, scale, and date. 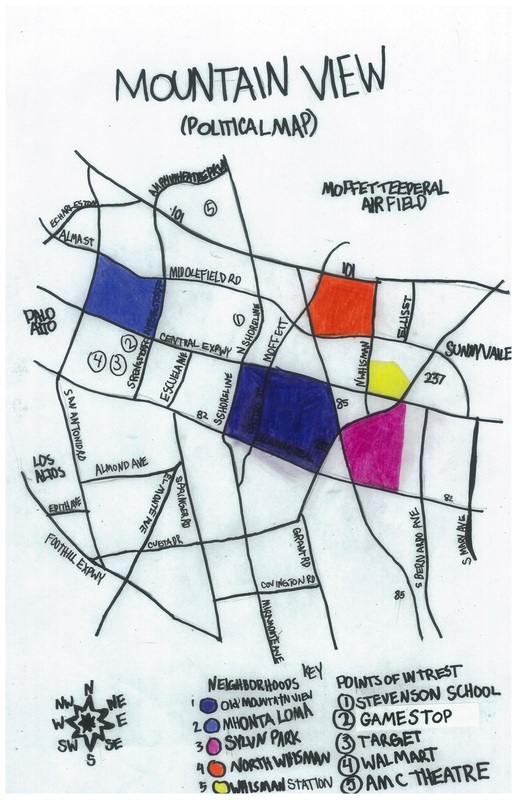 Locate on a map where their ancestors live(d), telling when the family moved to the local community and how and why they made the trip. Compare and contrast basic land use in urban, suburban, and rural environments in California. 2.3 Students explain governmental institutions and practices in the United States and other countries. Explain how the United States and other countries make laws, carry out laws, deter­mine whether laws have been violated, and punish wrongdoers. Understand the role and interdependence of buyers (consumers) and sellers (produc­ers) of goods and services. 2.5 Students understand the importance of individual action and character and explain how heroes from long ago and the recent past have made a difference in others’ lives (e.g., from biographies of Abraham Lincoln, Louis Pasteur, Sitting Bull, George Washington Carver, Marie Curie, Albert Einstein, Golda Meir, Jackie Robinson, Sally Ride). Trace the ways in which people have used the resources of the local region and modi­fied the physical environment (e.g., a dam constructed upstream changed a river or coastline). 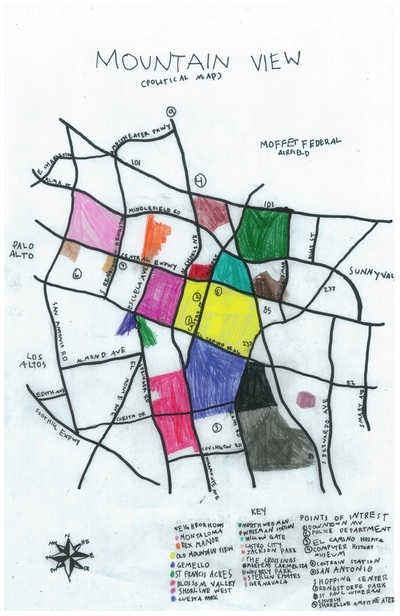 3.3 Students draw from historical and community resources to organize the se­quence of local historical events and describe how each period of settlement left its mark on the land. Discuss the relationship of students’ “work” in school and their personal human capital. Describe the Spanish exploration and colonization of California, including the relationships among soldiers, missionaries, and Indians (e.g., Juan Crespi, Junipero Serra, Gaspar de Portola). Discuss the role of the Franciscans in changing the economy of California from a hunter- gatherer economy to an agricultural economy. Identify the locations of Mexican settlements in California and those of other settle­ ments, including Fort Ross and Sutter’s Fort. Analyze the effects of the Gold Rush on settlements, daily life, politics, and the physi­ cal environment (e.g., using biographies of John Sutter, Mariano Guadalupe Vallejo, Louise Clapp). 4.4 Students explain how California became an agricultural and industrial power, tracing the transformation of the California economy and its political and cul­tural development since the 1850s. Understand the story and lasting influence of the Pony Express, Overland Mail Ser­vice, Western Union, and the building of the transcontinental railroad, including the contributions of Chinese workers to its construction. Describe the development and locations of new industries since the turn of the cen­tury, such as the aerospace industry, electronics industry, large-scale commercial agriculture and irrigation projects, the oil and automobile industries, communications and defense industries, and important trade links with the Pacific Basin. 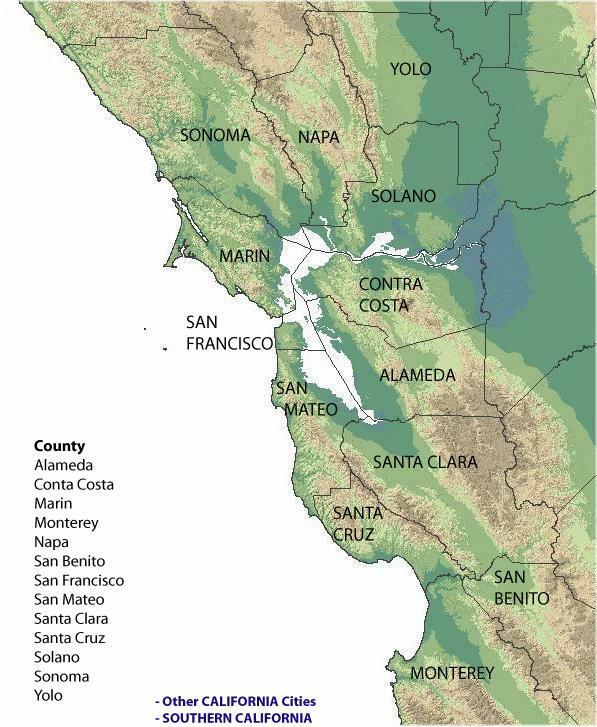 Trace the evolution of California’s water system into a network of dams, aqueducts, and reservoirs. Describe the history and development of California’s public education system, includ­ing universities and community colleges. Analyze the impact of twentieth-century Californians on the nation’s artistic and cultural development, including the rise of the entertainment industry (e.g., Louis B. Meyer, Walt Disney, John Steinbeck, Ansel Adams, Dorothea Lange, John Wayne). Understand the purpose of the California Constitution, its key principles, and its relation­ ship to the U.S. Constitution. Describe the components of California’s governance structure (e.g., cities and towns, Indian rancherias and reservations, counties, school districts). 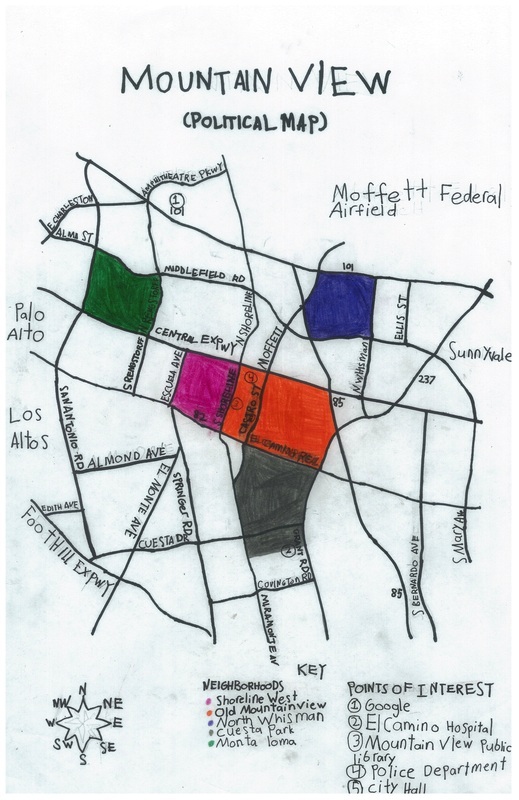 In order to teach students how to make political maps, I asked students to draw a map of Mountain View, including its roads, neighborhoods, and points of interest. They started using a map I adapted from this one, along with the success criteria here. If they chose, they could create additional political maps of California and the United States adapted from Netstate and Coloringcastle. 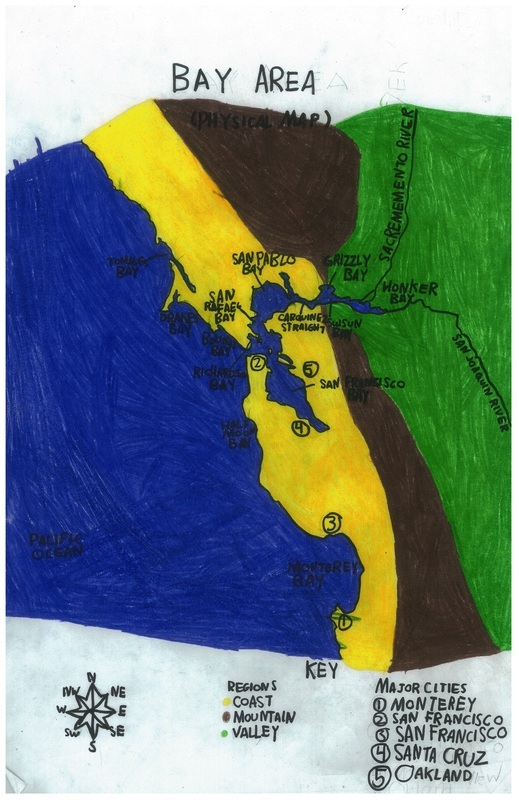 In order to teach students how to make physical maps, I asked students to draw a map of the Bay Area, including its bodies of water, regions, and major cities. 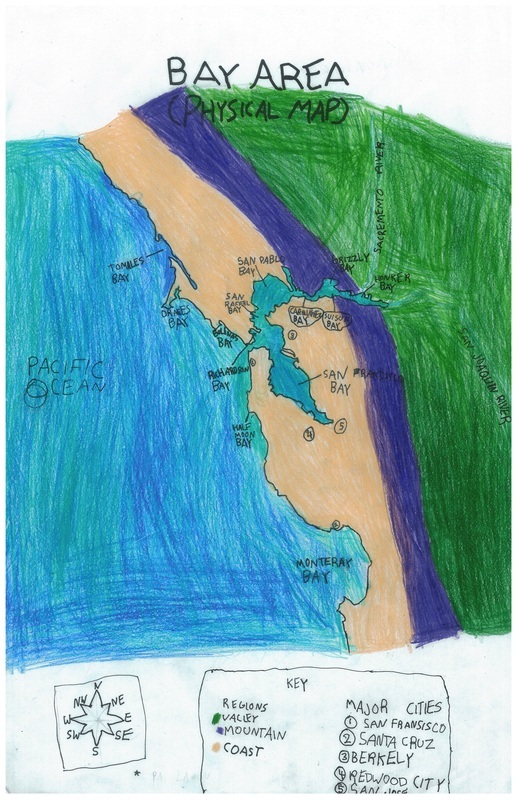 They started using a map I adapted from this one, along with the success criteria here. 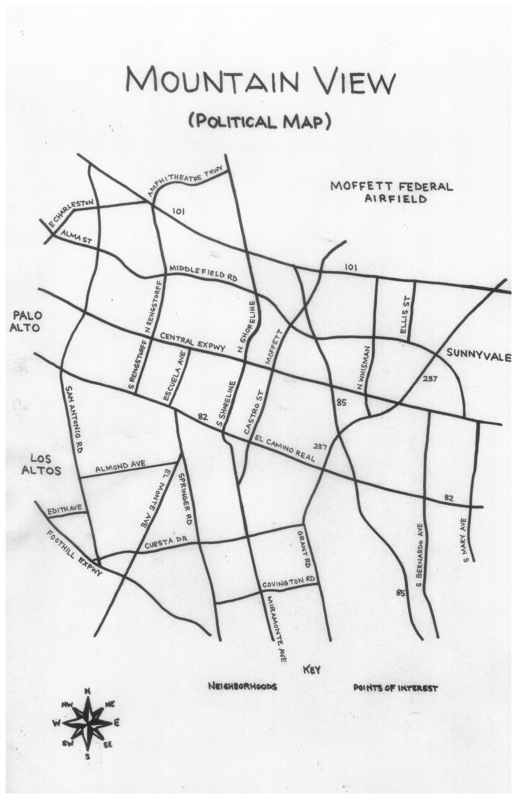 If they chose, they could create additional physical maps of California and the United States adapted from Netstate and Coloringcastle. Two years ago, I asked students to read a nonfiction news article of their choice once a week as their reading homework. They could read an article at their approximate reading level from a source, such as BBC Newsround or Newsela, which has articles written in multiple Lexile levels. For example, an article about the New York City mayoral race is written at a Lexile 730, 840, 1030, 1170, and beyond. They could also ask their parents to read to them from a more advanced source, such as The New York Times. I selected a relevant topic, such as climate change, as well as a discussion question, such as "Should we act to try to stop man-made climate change now, or should we wait until more people agree that it is a real problem?" A parent volunteer sent an email to families with links to related articles and videos. During our classroom meeting, I first read selections of those articles and play those videos for approximately 15 minutes. Next, we discussed the question for approximately 30 minutes. Finally, we spent about 30 minutes discussing other news stories that students find interesting. I took notes during our conversation in a Google Doc for future students. Notes from last year's current events discussions are available here. Prior to this arrangement, a parent volunteer sent an email to families with links to interesting local, national, and international news stories, and she also helped me facilitate a half-hour classroom meeting with a current events focus following the assigned homework. Finally, she wrote a summation of the conversation for future students. 3/26﻿/14 A student's parent shared some pictures from the 1853 Crimean War, which may have been the first war ever photographed. Students had questions about the soldiers' uniforms, cannonballs scattered on a road, cattle used for soldier's food, etc. Another student shared that pieces from Malaysian Airlines Flight 370 may have been found in the southern Indian Ocean, although other students pointed out that it had not yet been confirmed. Others questioned whether the plan could have travelled so far simply from ocean currents. 3/19/14 A student started by sharing his article about how seven countries were now looking for Malaysian Airlines Flight 370. Students wondered whether the plane could have been caused by a hijacking, a pilot suicide, or a pilot being drunk. I suggested that something could have gone wrong with the plane mechanically, causing the pilots to fall unconscious. Students also debated whether the plane was flying four feet or four miles above the water before it crashed, which caused some to double-check their articles. Finally, two more students shared articles about whether animals have feelings and the consequences for Russia annexing Crimea, like its suspension from the G-8. 3/12/14 A student began by sharing an article about a five-alarm fire at a construction site near AT&T Park and reported that, amazingly, there were no injuries. Another student shared that a missing Malaysian airliner had mysteriously gone missing. More students wanted to know what could have happened to it and whether the mystery could have something to do with the Bermuda Triangle. Finally, a students updated the class on the situation in Crimea. 3/5/14 A student began by giving an overview of the article related to Ukraine that he read: "The Ukrainian president was corrupt and aligned with the Russians even though most Ukrainians prefer Western governments. Students sought insights from one of our classroom parents, who is originally from Ukraine, and we looked at several maps of the world and the region in question. Finally, two students shared about dangers facing women in Afghanistan and how the Great Lakes were freezing for the first time in 20 years. ﻿2/19/14 A student began by sharing an article about how a Russian ice skater became eligible to participate in the Sochi Olympics just five days before the opening ceremonies. Another student shared a story about "sending red tape into outer space," which allowed us to talk about regulation as well as figures of speech, as this one led to a lot of confusion initially. A third student reported on how stink bugs are ruining orchards and farmers are bringing wasps in to eat their eggs and save endangered produce. Finally, a student shared an article about how an astronaut nearly drowned in his spacesuit during a recent walk in space and how a team of engineers installed a snorkel for his safety. 2/12/14 A student began by sharing an article about Russian figure skater becoming eligible for the Olympics just five days before the deadline. Another students shared an article about new "red tape" effecting travel into outer space, whereas there were once few laws with respect to space travel, and we had a lengthy conversation about bureaucracy and government regulations. shared about the Russian skater becoming eligible to skate by only 5 days before the olympics. She turned 15 just in time. Finally, a student brought up stink bugs ruining orchards and suggested that wasps could be brought in to eat the stink bugs, while another students shared a story about an astronaut who nearly drowned in space and decided to add a snorkel to his spacesuit for future missions. 2/5/14 A student began by sharing an article about millions of starfish in the Pacific Ocean are dying for no apparent reason, and we watched a video about this story from an episode of NBC Nightly News. Another student shared a story about how Texas has decided to make Algebra II, which is normally a required course, optional for high school students. We had a conversation about high school and college coursework, and whether it makes more sense to have more required classes or more electives. Finally, a student shared an article about a man who invented a car that drives on water. We estimated the cost of purchasing six of them, like the Prince of Dubai did. 1/23/14 A student began by sharing an article about how an elderly English woman, who broke German codes during World War II, died this week. We spent some time discussing why someone might risk their life for a cause, like helping one's country fight a war. We also discussing how Americans used Native American languages to trick code-breakers during the war, and another student shared a visual explanation about how Morse code works. Another student shared news about how a European spacecraft that was sent into orbit 10 years ago is set to wake up from its years-long hibernation in order to land on a moving comet - a feat that has never been done before. Finally, a student shared an article about how Governor Brown declared a drought in California this week, and we compared pictures of California and Nevada taken the same day during 2013 and 2014. 1/15/14 After discussing processed foods, a student share an article about water pollution in West Virginia. We discussed the ramifications of toxic water - no drinking tap water, no bathing, no doing laundry, etc. We also discussed geography in the eastern United States, including the Elk River, the Appalachian Mountains, and coal country; how coal generates power; and why burning coal causes pollution. Finally, a student shared that during a recent figure-skating competition ahead of the 2014 Winter Olympics, a male figure skater completed two triple axels - an extremely difficult move. 1/8/14 A student began by sharing an article about a shooting in Minnesota, involving Ms. Venezuela and her family. We stayed on this conversation for more than a half hour - with students only digressing to make connections and ask questions about profiling, manhunts, police most-wanted lists, and the criminal justice system. We looked at a map to see how far Minnesota is from California and then debated whether someone suspected of committing a crime could flee across multiple states in just a few days, especially during this week's severe winter storms. 12/18/13 A student began by sharing an article about the bomb threat during final week at Harvard, which allowed us to discuss college life, the seriousness of making threats, and the legal process. Several students read into the cause for industrial fire that kept students inside during recess on Tuesday, and we discussed local and world geography in relation to wind patterns and valleys as well as government regulations designed to encourage companies to take steps to encourage a create a work environment that is safe for people and free from pollution. Finally, a few students shared possible discoveries: ice on Mars, bones from neanderthals in Spain, and evidence of pink dolphins in Hawaii. 12/11/13 We began today by making a list of all the things we know about Nelson Mandela, and together students knew a lot of information: he was the first black President of South Africa, he recently passed away, he fought apartheid through non-violent means and also by waging war against the government, etc. I helped students turn their list of facts into a narrative. We then watched two short videos about Mandela's life - one that was professionally produced and one that was made by a third grade student in Africa. Finally, a student shared his article about Rube Goldberg machines, and we watched another video about a boy who tested one in his house and had a positive outlook on failure. 12/4/13 I began by sharing two videos I saw over the weekend. The first video was from the the Auburn vs. Alabama football game. We discussed how football is played, and I explained how Alabama was favored to win the game. With the game tied and one second left in the fourth quarter, an Alabama player attempted a field goal to break the tie, but missed and the ball was caught by an Auburn player who ran with the ball all the way down the entire field to score the game winning touchdown. We then discussed how unusual this event was. The second video was from a segment on "60 Minutes" that showed how Amazon is developing the technology to deliver packages in as little as 30 minutes by using small, self-flying helicopters. We then discussed how this change might affect the way we buy things online. Finally, we discussed a toddler who was recently featured on "Jimmy Kimmel Live" because of his ability to shoot basketballs on hoops at a variety of heights and from a variety of distances. 11/20/13 A parent began by following up on our discussion about NASA laser-based communications with a brief presentation on morse code. We discussed blue goats, which live in the Himalaya Mountains. We found Tibet on a map, and performed a Google search for "blue goat" in order to find out if they are actually blue. We discovered that they look like regular goats. We also discussed how the Make-A-Wish Foundation helped transform San Francisco into Gotham City over the weekend, so that a little boy with leukemia could take on the role of "Batkid." 11/13/13 I began by sharing an article I read about Typhoon Haiyan that hit the Philippines over the weekend and showing a map of the Southeast Asia and the Pacific Ocean. We discussed how different natural disasters affect different parts of the world, how typhoons are formed, and why natural disasters can be particularly devastating for people living in island nations. We also discussed California forest fires and space junk in South America. 11/6/13 I began by following up on our discussion of the World Series, noting that the Boston Red Sox won the series against the St. Louis Cardinals (4-2). I also shared news about elections in New Jersey, New York City, and Virginia, noting changes in party control and the size of the margins of victory. We also followed up on our discussion about the mysterious Google barge off the coast of Angel Island before turning to the discovery of a new species of platypus and a recent study showing that there may be tens of thousands of habitable, Earth-like planets in the universe. We touched on the differences between herbivores and carnivores and the conditions necessary to sustain life. 10/30/13 I began by sharing an article I read about how the tickets to Game 6 of the World Series at Fenway Park would be the most expensive baseball tickets of all time - with prices approaching $10,000 each for the best seats. We discussed possible reasons why tickets for this game would be so expensive, including the teams, the stadium, and the last time the home team had won the World Series there. 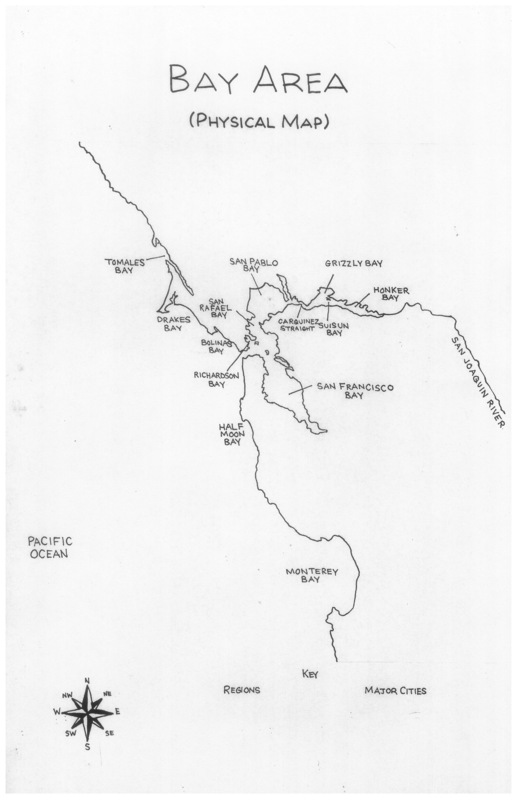 We also discussed the presence of a mysterious Google barge off the coast of Angel Island, comparing the location of Angel Island to Mountain View, San Francisco, and Oakland; a surfer who rode an enormous wave during a storm; and NASA laser-based communications as opposed to radio-frequency communications. Three years ago, I asked students to read a current events article of their choice once a week as their reading homework. Over the course of an hour the next day, each student introduced his or her article before all students could ask questions and discuss the articles they found interesting. At the end of our discussion, students voted on which article they thought was the most significant, and I saved that article for future students.